The “Spring Breakers” girls have been all over the big screen lately in the new film. Recently, they paused their press tour in L.A. to hold a premiere of the film, where many of their friends and supporters were able to come out to see the film, as well as make an appearance on the red carpet themselves. One attendee was current Disney darling Bella Thorne, who looked the part in a floral Topshop dress that had spring written all over it. Bella’s pretty in pink look perfectly matched the premiere’s not so red carpet. The bright and playful print of her dress was right on trend for spring, and the silhouette was both age and occasion appropriate. The actress continued her pink streak with a pair of Valentino pumps accented with some silver studs that added a little attitude to her look. She continued the edgy pretty theme with a stud accented pearl necklace, and a few gold bracelets completed her ensemble. This look works because the multiple shades of pink, from Bella’s pink dress to her pink lips, work together and don’t overwhelm one another, creating a cohesive and fun feel. A cocktail dress and heels might not be real-life ready, but a sweet skirt and flats definitely are! A denim skirt in a bright color and fun print is great for spring, and the pink floral pattern is a nod to Bella’s pink frock. 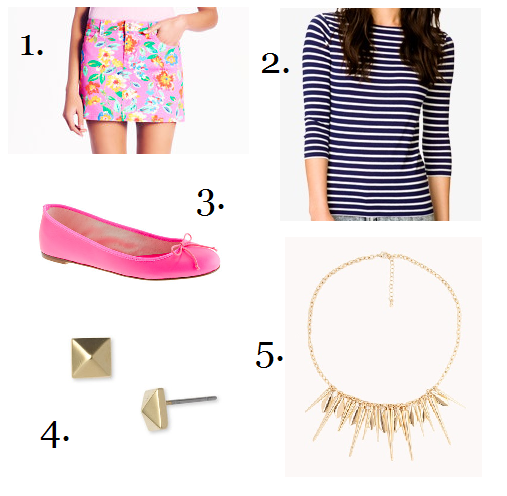 Paired with a striped tee, this look becomes a lesson in pattern mixing. These two patterns are subtle enough not to overwhelm each other, and the navy in the top picks up the small hints of the color present in the skirt. Instead of heels like Bella wore, a pair of hot pink flats will do the trick here, keeping the outfit casual and staying with the color scheme. As far as accessories go, gold and studded will do the trick here. Worn in moderation, studs and spikes add a dose of attitude to any outfit, and a small pair of earrings and delicate necklace are just the right touch for this look and echo Bella’s spiked necklace and studded heels. Along with florals, Bella was also working another trend in this look -- braids! Her braided up-do was perfect for her outfit, and would also be great for this week’s look as well. Casual, chic and a little bit messy, this beauty look is super versatile and super stylish.